This is a sponsored post as a Britax Latina Advisory Board Member and Blogger. As always, all opinions, ideas, and stories stated here are clearly my own. Our babies' and kids' safety is so important to us as parents. So as parents we want the best safety features for the products we use with our children. Car seat safety is very important to me. BRITAX is incorporating the ClickTight Installation System in select seats (Frontier 90 & Pinnacle 90)beginning May 2013. What is the ClickTight Installation System? 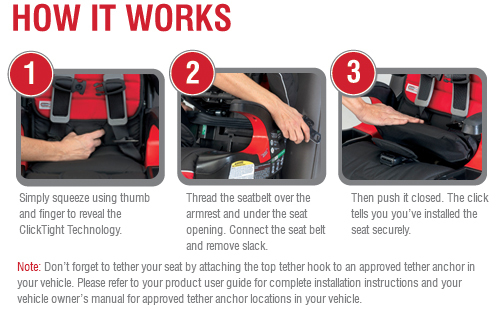 The ClickTight Installation System is a series of components engineered to simplify the process of securing your child’s car seat into your vehicle using the vehicle seat belt instead of the lower anchors that are a part of the LATCH system (Lower Anchors and Tethers for Children). The ClickTight Installation System simultaneously tensions and locks the vehicle seat belt. The result is both a tight and secure installation using the vehicle seat belt. Lower anchors are a part of the LATCH system (Lower Anchors and Tethers for CHildren). All vehicles have a lower anchor weight limit. That means when your child’s weight exceeds the weight restrictions or limits, the car seat should no longer be installed using the lower anchors. Instead you must install it using the vehicle seat belt system. Be sure to read your vehicle owner’s manual to confirm weight restrictions or limits for your vehicle. 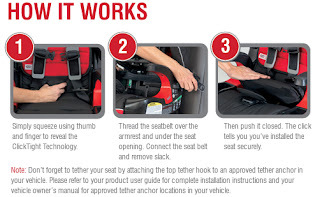 The BRITAX ClickTight Installation System allows you to easily achieve a safe and secure installation using the vehicle seat belt throughout the life of the seat, in harness mode, without having to worry about your child’s weight. When installed correctly, a car seat should not move more than one inch side-to-side or front-to-back at the belt path. A car seat that is not installed tightly leaves your child vulnerable to injury in the event of a crash. The BRITAX ClickTight Installation System allows you to easily achieve a safe and secure installation each and every time. * No shoving, kneeing, yanking, or tugging required. Locking latchplate, switchable latchplate, sliding latchplate, automatic locking retractor, switchable retractor, emergency locking retractor – any of these sound familiar to you? Traditionally, installing a car seat using the vehicle seat belt requires you to know what type of seat belt systems are in your vehicle; there may be different installation instructions depending on the type of seat belt system you’re using. What a great system BRITAX has. It will make me feel more sure about having the car seat installed properly. YEs, I did not know how much Britax focused on child safety until I visited them last year. It was great to see them actually testing the car seats, and they do test them, over and over. Great information thanks for sharing!